Charles Dodgson (aka Lewis Carroll) took this collodion photograph of Alice Liddell, dressed as Tennyson's "Beggar Maid," in her parents' Oxford garden in early June, 1857. In an age of smartphones and selfies, it's hard to imagine the challenges involved in creating a photograph in the pre-digital, pre-film era, when it took hours to capture an image, not a fraction of a second. Between 1827, the date of the first surviving photograph (rooftops from a window in Bourgogne, France by Nicéphore Niépce) and 1851, when the "collodion process" was invented, early photographers had two choices of medium: daguerreotypes and calotypes. The daguerreotype, named after its French inventor Louis-Jaques-Mandé Daguerre, dates from 1839. While it can capture fine detail, it's a one-off process, and the resulting image needs to be viewed from just the right angle. The calotype, introduced in 1841 by Englishman Henry Fox Talbot, was more convenient than the daguerreotype, in that it allowed multiple positive images to be made from a single negative, but lacked the fine detail of the "French" system. Neither process satisfied the needs of a relatively unknown British sculptor (who doesn't even rate his own entry on Wikipedia! ), Frederick Scott Archer. Wanting to obtain new commissions by sending photos of his work to potential clients, Archer's experiments went beyond one-off daguerreotypes and low-resolution calotypes. In 1851, he heard about the recently invented substance collodion, a mixture of guncotton (nitrocellulose), ether and alcohol. A viscous liquid, collodion dries rapidly into a clear, thin, elastic film; as a skin-like dressing, it was first used extensively on battle wounds during the 1853-1856 Crimean War. Archer's genius was to recognize that collodion could serve as a perfect matrix for light-sensitive silver salts, and in 1851 he perfected "wet collodion" photography. Like its predecessors, the process was still complicated, delicate and time-consuming, but its advantages were immediately obvious to photographers of the time: high resolution, multiple copies and exposure times of less than a minute (short in those days). One of the earliest adopters of the wet collodion process was a shy Oxford mathematics teacher and polymath, the Reverend Charles Dodgson, better known to the world as Lewis Carroll, author of Alice's Adventures in Wonderland. In the space of 24 years, from 1856 until 1880, Dodgson created around 3,000 images, of which some 1,000 survive. He took photographs of landscapes, buildings, famous people (including Alfred Lord Tennyson and European royalty) and — his métier — children. One of the kids, Alice Liddell, was the daughter of the Dean of Christ Church college in Oxford, where Dodgson lived and taught. Between 1857 and 1870, he made 11 portraits of Alice (and another seven of her with her siblings), all of which survive. 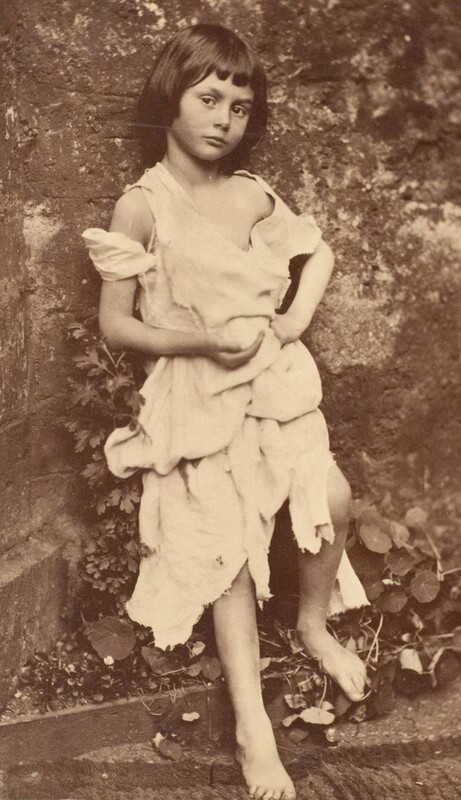 The most famous of these, taken in June 1857, is of five-year old Alice dressed as "The Beggar Maid," based on a Tennyson poem. Five years later, Dodgson and his friend Robinson Duckworth ("Dodo" and "Duck") would take Lorina, Alice and Edith Liddell ("Prima," "Secunda" and "Tertia") on one of their frequent rowing trips. As usual on these "expeditions," Charles Dodgson made up fantastic tales to entertain the kids as he and Duckworth rowed upriver. On this singular occasion, however, Alice begged him to write down the stories for her. And thus was borne Alice's Adventures in Wonderland. Barry Evans (barryevans9@yahoo.com) would love to have taken tea with Lewis Carroll, with or without the Mad Hatter.